The digiID IV features a unique design, robust features, and with its unsurpassed quality it will quickly become the market leader for secure and convenient door access within a home or office environment. Stylish and easy to use, this fingerprint door lock offers a sliding front cover that not only allows protection for the optical sensor against the outdoor elements but also activates (wakes up) the fingerprint scanner when lifted. Having the ability to register up to 300 users (admins, users, and guests) should provide a suitable user count for almost any need. 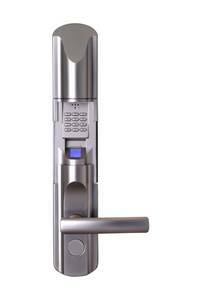 The digiID IV lock offers the ability to manage the registered users directly on the lock. Features a administrator built in audit trail directly on locks LCD display of the last 100 entries and their names. Offering the ability to search buy Name, Date, or ID, its your call how you would like to view the audit trail log! If you want a easy setup and configuration than this is the lock for you.